A basic but important feature of the Chivers Reef Shark is that the bow rails are all within the coaming’s perimeter, meaning they are not accidental fenders – although Chivers have left then unpainted anyway, as they did the rubbing strakes and the rim of the anchor well. A point not usually considered about side and bow rails: the legal maximum beam for unrestricted towing is 2.5 metres overall. If the rails venture outboard of the hull, that is what is going to be measured by increasingly attentive inspectors. The centre console is big enough to provide serious stowage on two levels; at deck level, a foot bar doubles as a gear restraint. The dash area is big enough for a wide range of screen sizes. The protection provided for the console and its vicinity is way beyond average. The T-top, carried on massive supports, extends to the gunwales and a considerable distance fore and aft. The windscreen extends from the console to the T-top. The helm seat is a double, essentially a storage compartment with a padded top. The top hinges open in two parts to reveal shallow oddment storage. The volume below is reached via a rear door. That is the extent of the permanent seating. Auxiliary seats could be provided by an esky that Chivers has planned deck area for. 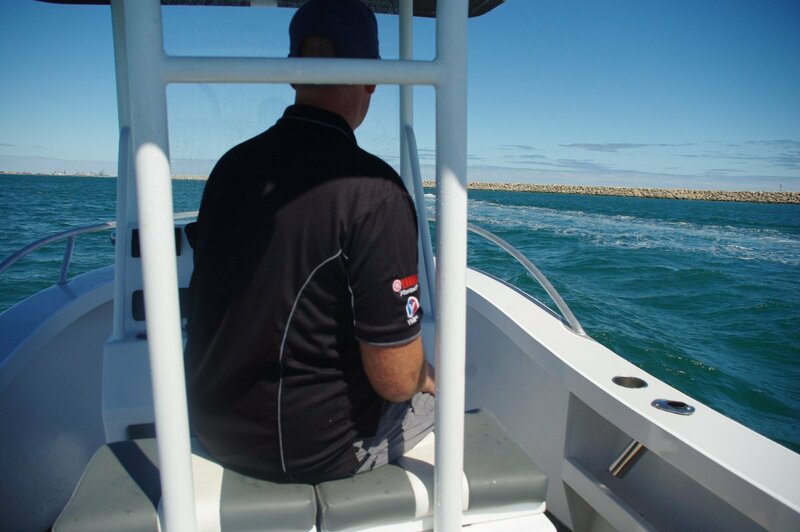 It could be placed either ahead of the console or aft of the helm seat, in either case leaving room for fishing action. Forward the flare of the bow makes the deck width less than that of the sides at the gunwales. To compensate, the side decks increase in width so that when feet on the deck touch the sides, thighs contact the coaming with the body held upright. This is detailed thinking that has evolved with practical experience. 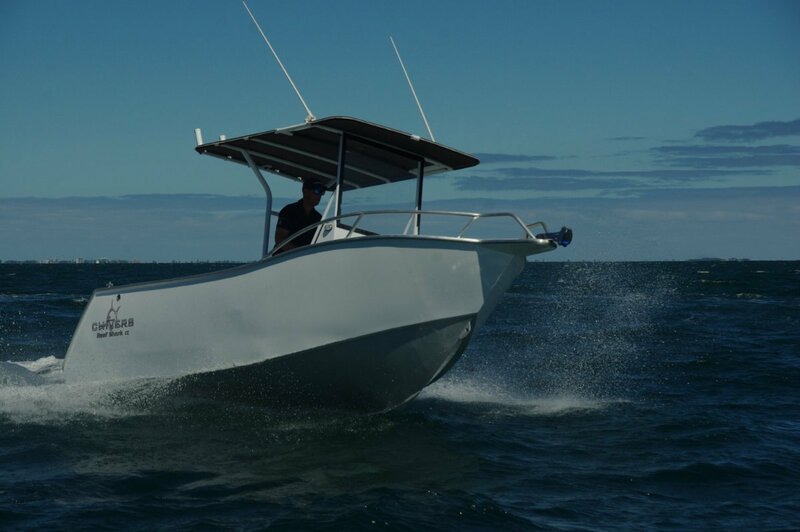 Like all the Shark series, the Reef Shark provides room for a productive day’s fishing: a pair of 140 litre under deck catch tanks. These tanks sit within the fore and aft frames that span the height between the 5mm bottom and the self draining deck. The middle compartment contains the 140 litre fuel tank and the self filling and draining ballast tank. This fills as the boat comes to a halt and empties within seconds of opening the throttle. That system works well. Flooded it drops the chines below the surface, balancing the deadrise which is steep for a17 footer: this is a noticeably stable boat. The draining process is barely noticeable: no gradual grudging involved at all. Move the throttle forward and you are up and planing. 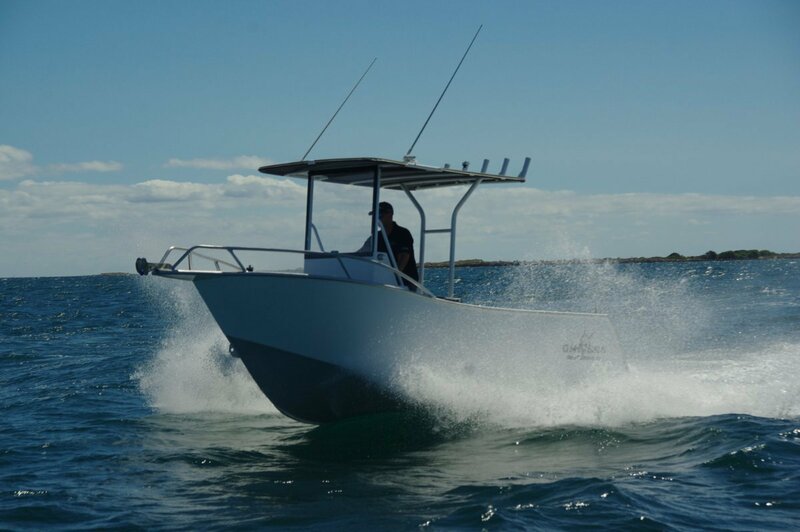 Past Reef Sharks have commonly been fitted with 115hp, but the review boat had a 90hp Yamaha that delivered better than adequate performance. The reason for this is that it is a new generation 90 using the same size block as the 115. It is cheaper to buy and cheaper to run in terms of fuel consumption, can exceed 32 knots flat out and cruise effortlessly at 22 or 23. Thoughtful touches abound. A small but valuable one is lining the anchor well with carpet. The clinking of chain as the day progresses can be as maddening as a dripping tap - in the old days the two-stroke motor largely drowned it. Masking the rim of the well before painting prevents the chain from abrading the paintwork. But probably the most thoughtful and valuable was the standard provision of dual batteries. What a largely open boat needs is plenty of things for people to hang on to. 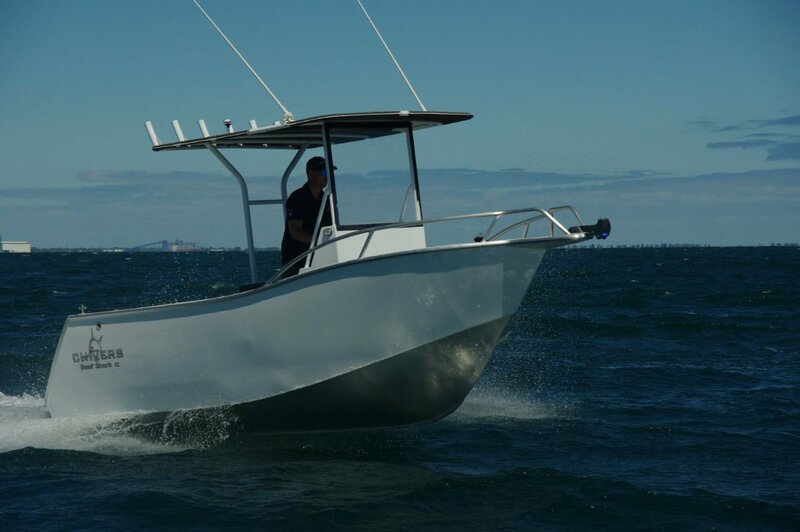 The Reef Shark shines here: heavy duty grab rails everywhere, as well as secondary use of pipework structure. This is not a large boat so movement in a sea can be vigorous. The sea we had on the review day was the result of a couple of hours of a rapidly increasing sea breeze, so short steep seas and lots of them were the result. Yes, the 555 moved up and down a lot, but the significant thing was the downs were softer than on most five metre boats due to sharp bottom. It was quieter too, thanks to a massively rigid structure.